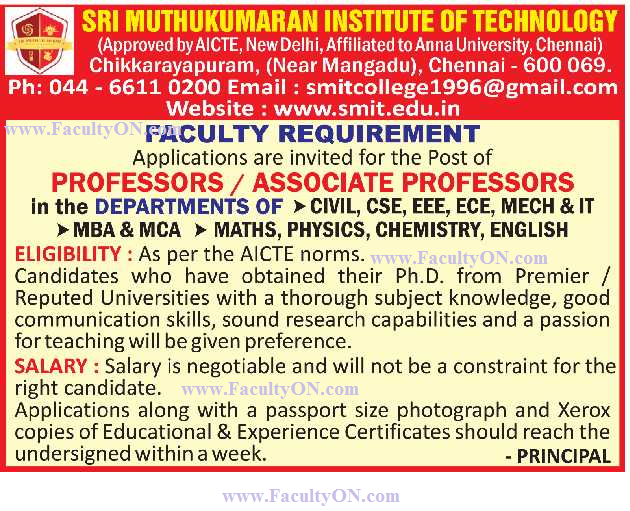 Sri Muthukumaran Institute of Technology, Chennai has advertised in THE HINDU Opportunities newspaper for the recruitment of Professor / Associate Professor jobs vacancies. Interested and eligible job aspirants are requested to apply within 07 days from 22nd November 2017. Check out further more details below. About College : Sri Muthukumaran Institute of Technology was established by Sri Muthukumaran Educational Trust in the year 1996 and it was declared as Telugu linguistic minority institution by the order of the Government of Tamilnadu. It is initially affiliated to University of Madras and now affiliated to Anna University, Chennai approved by AICTE and five programmes such as ECE, CSE,EEE, MECH and IT are accredited by NBA. The college started with 4 UG programmes and now it has 6 UG and 7 PG programs. Now five UG programmes, viz, CSE, ECE, EEE, Mechanical Engineering & Information Technology and two PG programmes, viz, Computer Science and Engineering and MCA have obtained permanent affiliation from Anna University. Qualifications: As per AICTE norms. Ph.D will be preferred.